thisquietarmy is the solo project of Canadian Eric Quach (formerly founding member of the instrumental post rock band outfit DESTROYALLDREAMERS). Since 2005 he explores under this moniker the never-ending spectrum of the guitar and its potential for exceptional ambient and loop drone sounds. Characterisic for Quach’s experimental sounds is the inclusion of structural elements and textures from different genres such as post punk, shoegaze, kraut rock, post rock, black metal and doom metal. With a boundless creativity and energy Quach has released 20 physical records so far and has played over 250 concerts all around the globe in over 25 countries, including Canada, the US, Brazil, and almost all of Europe. 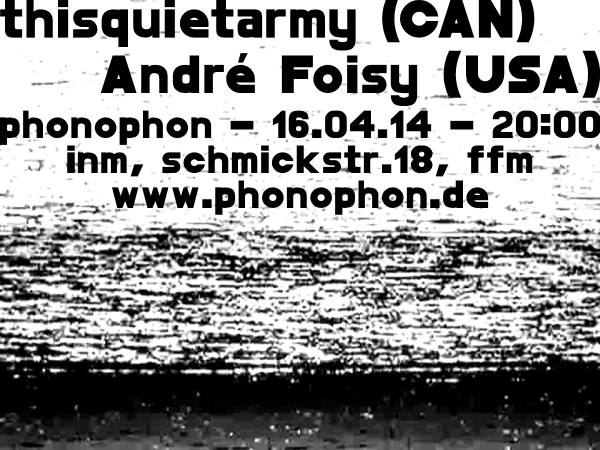 André Foisy is a founding member of Locrian (Chicago / Relapse Records) who will be performing at Roadburn 2014 and formerly ran the Land Of Decay label with Terence Hannum. His other current projects include Kwaidan and Eolomea. He also releases music under his own name (Land of Decay, Stunned Records, Twilight Luggage, Small Doses). His solo sets consists of experimental guitar, tapes & vocals, strongly in the spirit of the works Locrian created before turning to black metal: layers of soft strong flowing beauty, building and eventually falling through peace and climax.